I was looking at my buddy ok's web blog ( definitely click on the name and check it out) and looking at some of the great photos he had posted and I thought that I should post some of my own. So I hurried home and opened my shoebox of old photos and after going through 4 rolls of me and my friends being piss-drunk in most photos I started to look for my arty-farty pics. Instead I found a bunch of photos that were ruined by a blurred mass, which if some people are to be believed is the only appendage that keeps the dolphins from re-building Atlantis. This little appendage is the thumb. I was actually looking forward to the picture above when I had taken it. 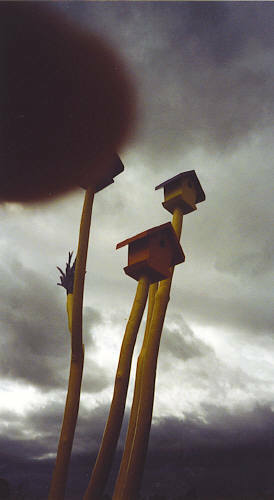 A local park had some art exibit and one of them were these "Dr. Suess" style birdhouses. So with confidence I aimed my lens and snapped a shot. I waited to the film to be developed, picked up my pics and wouldn't you know it, big as all day my Meat Digit had ruined my shot. But this is not a rare occurance, my thumb has reappeared time and time agin, much to large to Photoshop out, and has spoiled many pictures. At family gatherings, interesting landmarks and locals and blakmail photos from bachelor parties. Great shot elsnoozo! I can't wait to see more in the series.